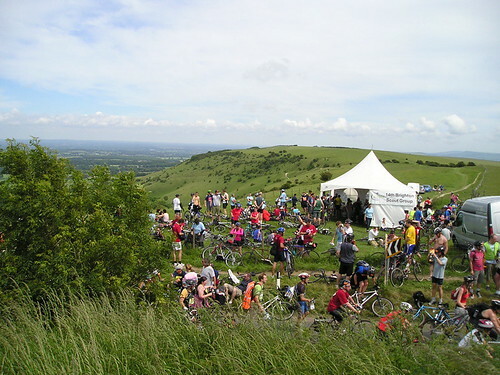 Michael Jecks: Photo Diary » Blog Archive » This is the top of Ditchling Beacon. This is the top of Ditchling Beacon. This is the top of Ditchling Beacon., originally uploaded by michael_jecks. Chris was fairly worried that he may get another puncture, so he went on a little. He reckoned that if he had another disaster, he could let us know and weâ€™d all be behind him, so heâ€™d be able to get some help. What he hadnâ€™t realised was, just how far ahead he was getting. He reached Brighton two hours ahead of the rest of us! Phenomenal riding for a bloke whoâ€™s never ridden more than about twenty miles. Anyway, the rest of us had burgers (Bazle the Burger) and cake, sweets and bananas. Not me, naturally. My body is a temple and I worship it. Well, itâ€™s big enough, anyway. So I had a ham and tomato sandwich from the scouts at a stop near Gatwick, and some Lucozade to go with the three litres of water I drank. Oh, and I did have a choc-ice at the top of Ditchling Beacon. That was the only place that really did give me problems. Itâ€™s a long hill, and rises in a series of sweeps, so that each time you think youâ€™ve got to the top â€“ nope, God has in his infinite wisdom, stuck another ruddy hill in front of you, steeper than the last. It is horrible, made still worse by damn fool bikers who want to walk in a line abreast, blocking the route for any people still tottering along on a bike. Like me. So I was forced, forced, to stop every so often. But although I paused four times, I did not walk. I merely rested, drank more water, and rode on. Great fun. And then I was at the top and Bazle and Aidan were there as a welcoming committee. This entry was posted on Tuesday, June 19th, 2007 at 3:13 pm	and is filed under Bike ride, Dartmoor. You can follow any responses to this entry through the RSS 2.0 feed. You can skip to the end and leave a response. Pinging is currently not allowed.